It's time to play outdoors! Here are five ways to enjoy some QualAuntie Time with nieces and nephews this spring and summer. 1. Amp Up Your Frisbee-Style Play! Frisbee-style play is an awesome activity to get you and the kids running and stretching. This spring, amp up your style with the Aerobie Pro Flying Ring. Our friends at TTPM.com say the manufacturer “claims to have set world record for farthest thrown object at over 1,300 feet. It's easy to throw, easy to catch, and is soft so no one will get hurt when catching it.” The Aerobie Pro Flying Ring can be played with just two people, or even in a large group. A water balloon toss is great way to cool off on a hot day. Kids will love trying to catch the water balloons and are guaranteed to laugh if and when it splashes all over them - or you, Auntie! No balloons at hand? Try the new Wet Head game from Zing Toys. Our friends at TTPM.com that Wet Head is the "hilarious new family/party game that can leave you all wet. The game comes with a yellow helmet and a spinning unit that snaps on the top. Snap the unit onto the helmet and insert pins in each of the holes. Then, fill the chamber with water, and you're ready to go. On each turn, place the helmet on a player's head. Spin the spinner to see whether to pull 1 or 2 pins, pass, reverse or other variations. If you pull a pin and nothing happens, you got lucky. The turn passes. Play continues till one player pulls the pin that releases the water and gets a wet head! Play continues as long as you want, or until everyone is completely water-logged." We've seen this new toy in action, and boy, is it fun! Have your nieces and nephews find some pine cones and cover them in peanut butter and some birdseed. Children can watch from the window as birds flock to the homemade feeder! Not sure this is the right homemade bird feeder project for your nieces and nephews? BigDiyIdeas.com has curated a list of 40 more ideas! Visit a home and garden store or local market to find flowers to plant in your garden or theirs. No garden? Get some clay flowerpots, soil, flower beds or seeds, and watch the flowers grow over time. Even better? Nieces and nephews can decorate their flowerpots any which way they like. 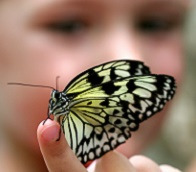 Your nieces and nephews can watch caterpillars create their cocoon and grow into beautiful butterflies. They will be able to experience the process of how a caterpillar turns into a butterfly! These kits by Insect Lore are a great place to start!